What Type of Door Is Best for Your Entryway? When you're shopping for a new entry door, you've got a lot of decisions to make. But while you're grappling with the right architectural style and finish, don't lose sight of the single most important decision: the material your door will be made of. You put a great deal of trust in your front door, counting on it to form a good first impression of your home for any visitor or passerby. For that reason alone, the front door is more important than it’s typically given credit for being. But the fact is that your front door needs to be much more than beautiful. It must also be strong enough to keep out would-be intruders, and it must be durable enough to withstand glaring sun, driving rain, and all the other challenges your local climate might bring. So if you’re seeking to give a fast and dramatic facelift to the facade of your home, be certain that you’re choosing a replacement door that’s up to the task. With any investment you make in your home, there are up-front as well as ongoing costs. Entry door selection is no different. In weighing your many options, take the time to understand both the immediate benefits and the long-term requirements of any door you’re considering. There are plenty of factors that affect a door’s appearance, durability, security, and price, but what matters most is the material a door is made of. Choose a door of the right material, and you’re likely to be rewarded with smoother day-to-day operation, minimal annual upkeep, and—more often than not—energy savings. Picture a front door in your mind. What you’re most likely picturing is a wood door. For decades, wood was the only option, and it served homeowners well. Aesthetically pleasing and with a satisfying heft, wood doors are highly versatile, lending themselves to virtually limitless paint and stain possibilities. Because it’s possible to resize a wood door by planing it down, there are many wood doors around the country that have led very long lives, used over and over again in different applications. But for all their merits, wood doors can be problematic, mainly because the material is naturally porous. Wood inevitably expands and contracts along with changes in temperature and humidity, and in some cases, it can warp, cup, or twist. Furthermore, when exposed to moisture, wood doors can fall victim to rot. Homeowners can fend off those threats to the beauty and proper functioning of a wood door, but it takes work. Even though their manufacture has become more sophisticated and their resiliency has improved, wood doors remain sensitive to the environment. If you purchase one, expect to sand, stain, or repaint it every few years—and perhaps more often than that, if you live in area of the country with a wet, humid climate (for example, the South). Steel doors make up for the shortcomings of wood and boast advantages all their own. For one thing, steel doors are far more durable. That makes them an ideal choice for regions such as the South, where the combination of glaring sun and heavy rainfall would work against the longevity of a wood door. Also, steel doors neither expand nor contract, which means they always open and close smoothly, no matter the time of year. Perhaps best of all, many home experts agree that steel doors provide the greatest amount of security. While critics say steel doesn’t look as good as wood, new designs from industry leaders like Masonite are changing that perception. Masonite steel doors, available at The Home Depot, feature deep, high-definition decorative panels that closely mimic the look of high-end wood doors—without the maintenance that wood requires. Plus, with Masonite doors, homeowners can choose from an array of glass inserts that can make a steel door even more eye-catching. Considering that steel doors insulate better than wood, it’s a pleasant surprise that steel doors are often the most affordable option! 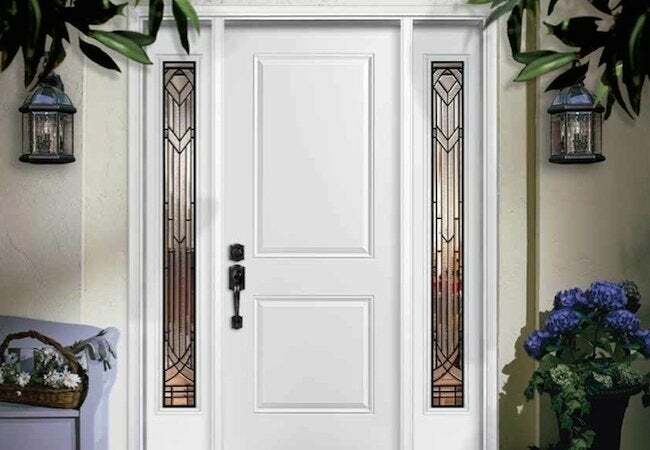 The newest material for entry doors is fiberglass, and it’s fast becoming the most popular. Unlike steel, fiberglass isn’t prone to rust. And unlike wood, fiberglass doesn’t rot. 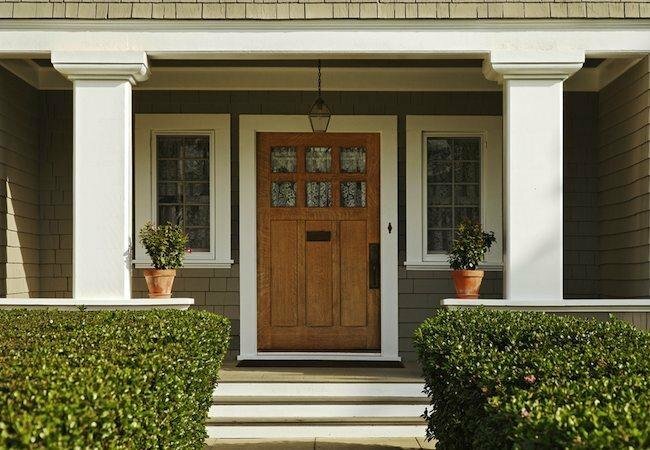 Benefiting from the latest in manufacturing technology, fiberglass entry doors are impervious to the environmental factors that threaten other types of doors. Genuinely low maintenance, fiberglass doors resist dents and are surprisingly tough. Plus, they provide best-in-category insulation, helping homeowners keep their monthly utility costs as low as possible. What seals the deal is that there are now more style options than ever before. 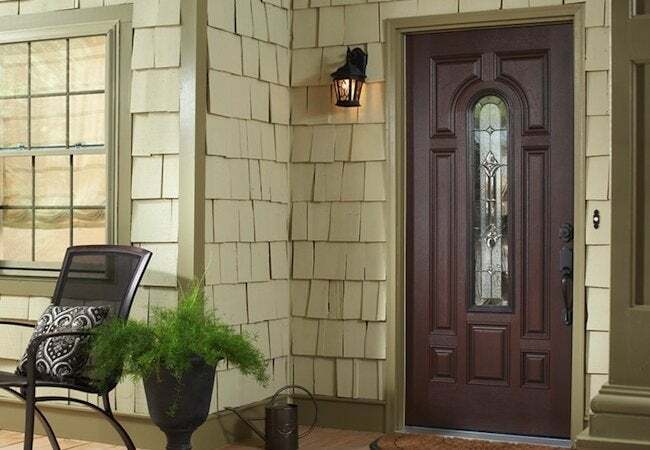 At The Home Depot, Masonite alone offers three families of fiberglass entry doors. The company’s Barrington fiberglass door collection combines the high performance of fiberglass with the beauty of hardwood, while Belleville fiberglass doors offer superior architectural design. 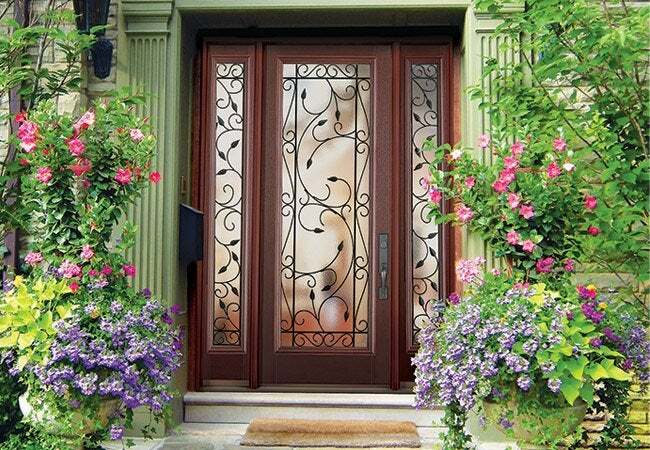 In either case, you can go a step further to personalize your door, choosing a decorative glass insert from the wide variety of designs offered by Masonite. With such a broad selection, you’re bound to find a door perfect for your project. Still not sure what type of door you want? Check out Masonite Max. Offered jointly by Masonite and The Home Depot, Masonite Max is an easy- and fun-to-use online tool that guides you through the process of designing and a purchasing a door that perfectly matches your style preferences and functional needs. This post has been brought to you by Masonite. Its facts and opinions are those of BobVila.com.